Nighttime in Bangkok is full of lights, from building lights, to street signs and moving cars. You can feel the energy of Thailand’s largest city come alive at night. 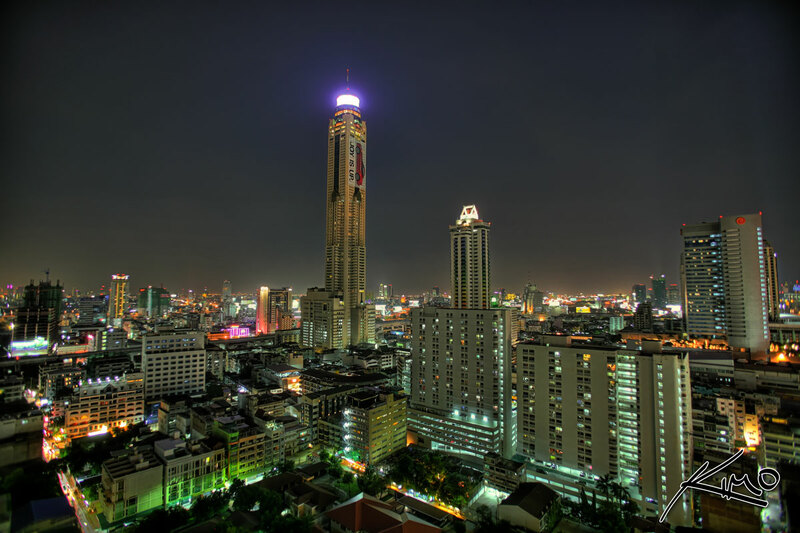 Making Bangkok a perfect city for shooting nightime HDR photos. This is a shot of the Baiyoke Tower II or Baiyoke Sky Hotel. I finally had time to research and verify that this hotel is the tallest building in Bangkok. I posted a similar photo a few weeks back of the Baiyoke Sky Hotel during sunrise. I also have another shot during sunset, which I’ll post soon. I really wanted to shoot the Baiyoke Tower during mid-day but it’s scorching hot during that time. Not really sure if it’s worth getting a heat stroke over.